Mandy Moore and Zachary Levi will reprise their roles as Rapunzel and Flynn Rider. Joining them in the all-star cast is Ashley Judd as Rapunzel’s mother Queen Arianna, Eden Espinosa as Rapunzel’s handmaiden Cassandra, Jeff Ross as Hook Hand’s brother Hook foot, and Richard Kind as Uncle Monty. Other stars from the original film are also reprising their roles including Jeffrey Tambor as Big Nose, Paul F. Tompkins as Shorty, and M.C. Gainey as Captain of the Guards. The cast will also include Sean Hayes (Will & Grace), Peter MacNicol (Ally McBeal), Clancy Brown (The Shawshank Redemption), Adewale Akinnuoye-Agbaje (LOST), Steve Blum (Star Wars Rebels), and Jonathan Banks (Breaking Bad). 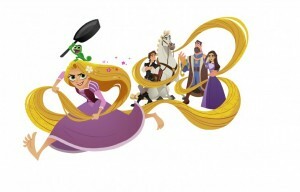 Look for Tangled: Before Ever After in 2017 on Disney Channel.